“mr sauna” takes on the worlds biggest yacht race ! Just about to round the Needles. 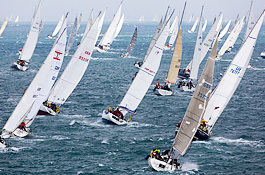 The “Round the Island” race is the largest yacht race in the world, with easily over 1400 yachts and 15000 sailors from all over the world taking part each year. This year “mr sauna” will be taking part on board the Aurora, a lovely Bavaria 44 yacht. This will be the fourth time that Gerard McCarthy of mr sauna Ltd has taken part in the Round the Island, the first time managing to beat the National team of France’s “France Two”, completing the course in an impressive 7 hours. 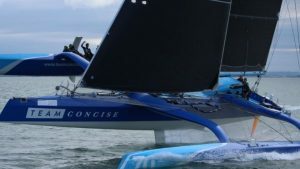 Even more impressive is the record time set in 2016 by skipper Nick Collier Wakefield on board the Concise 10, completing the 50 mile course in a mind blowing 2 hours and 23 minutes. Concise 10 skippered by Ned Collier Wakefield. Its doubtful that this years heat wave will lead to such times, but I am sure that it will be a fun event, and that there will be sufficient incentive to get back to Cowes before the bars shut ! Yachts in breezier conditions take on the the RTI race.